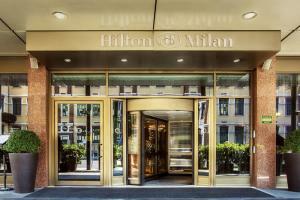 Located only a block from the Central Train Station, the Hilton Milan puts you within easy reach of the city's cultural hot spots including the magnificent Duomo Cathedral and La Scala. Spacious guest rooms feature contemporary design and thoughtful amenities for your comfort and convenience. The 24-hour fitness center offers cardio and weight equipment so you can keep up with your workout routine while on the road. Located only one block from Central Train Station and airport shuttle buses; just five minutes from La Scala opera house and Milan's famous fashion triangle.